Hi everyone and welcome to another sketch challenge at ATSM. Lots of crafters seem to like a sketch as it gives you the basic structure for your card and we have a nice simple one for you this week. We are also sponsored once again by the amazing Bugaboo who are offering 7 free digi stamps to the winner of this weeks challenge. Apologies for the bad photo but I tried everything to no avail! The base card is pearlised, which always appears pink in my photos. I took a smaller piece of navy card and punched a scallop out and using the waste as my guide, I stamped a design on the base card using Su Botanical Blooms and Wild Wasabi and Marina Mist inks. The butterfly is from SU Live your Dream and I added a couple for some dimension. 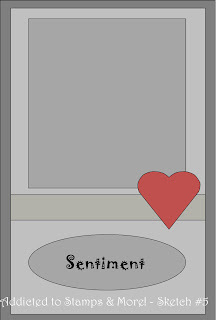 The sentiment is a See Dee one on a Just Rite diecut label. The ribbon was off a present and finished it off. It's an elegant card. You've stamped the scalloped oval beautifully - at first I actually thought you had used a DP - and the butterflies are so decorative! 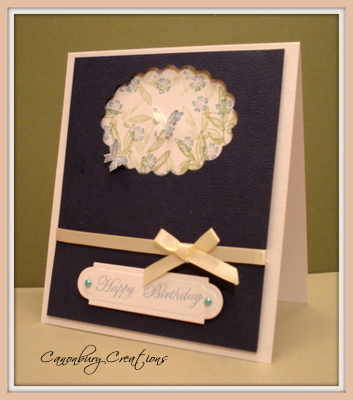 Such wonderful use of the sketch Valerie and I love the elegance of this card. Again Valerie such elegance and simplicity!!!!! Love this color combo!!!!! Wow just stunning!!!!! Great interpretation of the sketch - always handy to have the layout decided for you isn't it? Beautiful sketch and a lovely card Valerie! Great take on the sketch, its a beautiful card. Great card Val. Love the navy top with the cut out. Pretty butterflies. Hope the kitchen is more or less finished now? Morning Val. Such a lovely card. Pearl card and mirror card are so hard to take photos of. I keep forgetting about turning the sketch. Love how you have used the bow instead of the heart. Hi Valeri, sounds like you have been very busy and send you my sincere condolences . Fab card a nd great take on the sketch such a stylish beauty. This is so pretty Val! I love your take on the sketch with that cut out and the bow. Hope all turns out beautiful in the kitchen too.